All of Gardner F. Fox’s Sword and Sorcery books are in reprint! The Gardner Francis Fox Library is proud to have all 10 Sword and Sorcery stories written by Mr. Fox in eBook reprint. Sword and Sorcery was Mr. Fox’s favorite genre to write for. He crafted three separate heroes for publishers in the 1960’s and 1970’s. Kothar the Barbarian Swordsman, Kyrik Warlock Warrior, and Niall of the Far Travels. Plus the cosmic thriller, The Druid Stone as a bonus book. The Druid Stone is a story about a character that is sent to a world that is in a sword and sorcery setting. Making this an 11 eBook Collection! Gary Gygax listed Kothar and Kyrik as Appendix N Material. He also commissioned Mr. Fox to write Niall of the Far Travels for The Dragon magazine. 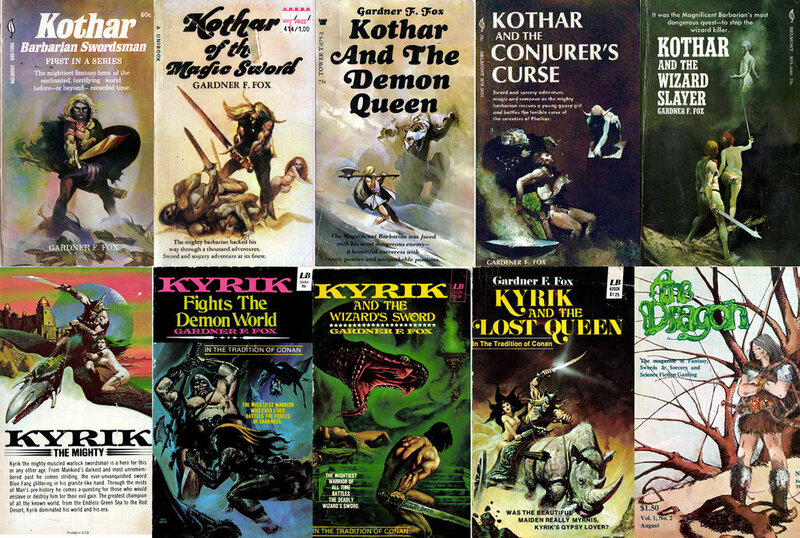 His Kothar books were lucky enough to have their covers painted by Jeffrey Catherine Jones and his Kyrik books would be painted by Ken Barr. kothar’s second book has four illustrations in it. The illustrations were created by Frank Robbins. Mr. Robbins mainly drew for the comic book industry. He is best known for creating the comic strip Johnny Hazard. These are all of the 11 eBooks that are in the style of a sword and sorcery adventure. Please click any of these titles for purchasing. If you have any questions please feel free to contact us. Fee free to contact us with any questions.